Having “problem” skin doesn’t mean that you have to spend your mornings shackled to your bathroom vanity with an arsenal of products. Developed with the help of renowned dermatologist, Dr. Ava Shamban, our no nonsense 2-minute beauty routine is ideal for everything from aging to acne prone skin. Therefore, no matter what your skin type, you can get up, get gorgeous, and get going in just minutes! Start (and end) your day with cleansing cloths or mild scrubbing pads to remove dirt and makeup while gently exfoliating. If you have dry, dull, aging skin, or skin conditions associated with dryness like rosacea or eczema, look for gentle, sulfate-free, non-foaming cleansers with hydrating serums to avoid further drying. For acne prone, oily skin, use oil free cleansing cloths or pads with salicylic or glycolic acid to prevent pimples from developing underneath the skin’s surface. Next, it’s time to moisturize and prime the skin for makeup application. “Regardless of your skin type, moisturizer that contains sunscreen is a must,” says Dr. Shamban. For dry skin, in addition to sunscreen, your moisturizer should contain glycerin and ceramide to help lock in moisture. Oil free moisturizers are best for reducing breakouts and unwanted shine associated with oily, acne prone skin. If you have rosacea, use a light, soothing moisturizer with anti-inflammatory ingredients like aloe vera, green tea, cucumber, or chamomile. For combination skin that is oily and has rosacea, opt for oil free moisturizers with anti-inflammatory ingredients. For mature, aging skin, moisturizers with ingredients like pomegranate, lactic or peptic acid, and vitamin C are best. After priming the skin, use concealer on imperfections. To reduce the appearance of pimples, discoloration, or other imperfections of the skin, dot with concealer, which should also be applied under the eyes, and blend well. Remember, foundation is NOT the same as concealer and will not work to cover blemishes. For extra pimple fighting power, use a concealer that contains salicylic acid to stop new breakouts before they reach the surface. Apply foundation wherever needed, or all over the face, for a smooth, even appearance and set with a loose powder to avoid embarrassing shine. Want to save even more time? Use a tinted moisturizer after washing your face, then top with a loose powder (optional) and forego the foundation altogether. Next — highlight your features! Choose a blush or bronzer for a splash of subtle color on your cheekbones and eyes. For dry or aging skin, opt for gel or cream based blushes over powder ones for added color and moisture. 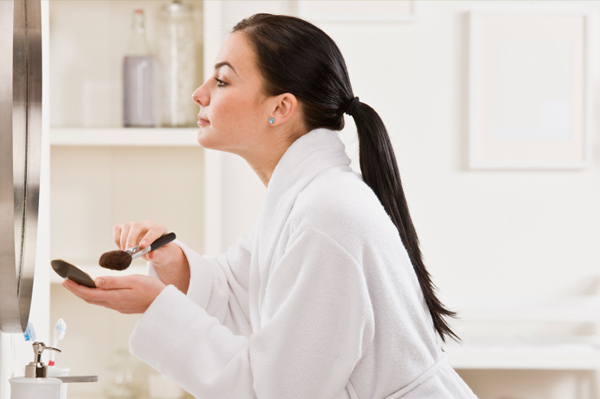 For oily, acne prone skin, use powder blushes or bronzes to fend off unwanted shine. Curl and lengthen lashes in one easy step. To finish your eyes, give your lashes a quick brush of mascara, using a formula that both curls and lengthens so you can skip the bulky eyelash curler that looks more like a medieval torture device. Complete your look with lip liner for long-lasting color. Simply line the lips, fill them in, and then blot until you get the look you want. Head out the door feeling and looking fabulous — ready to take on whatever the day may bring! 100s of our best beauty tips all on one place!